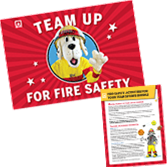 Fire safety is a win-win with Sparky®'s Team Up for Fire Safety Flag and Fire Safety Activities for Your Team Sports Brochure! Everybody can get behind fire safety when you let this 4'x 6' Sparky the Fire Dog® Flag fly. Use it indoors or out, on a field house, over a dugout, on a fence or in front of a table. Wherever you display it, NFPA's colorful Team Up for Fire Safety Flag is a real winner! This spirited set includes a free NFPA® Fire Safety Activities for Your Team Sports Brochure (a $5 value). Make the most of your captive audience with this handy brochure, which features races, games, and group activities for kids and families, plus easy-to-follow directions for organizing the activities. As an added BONUS, the Fire Safety Activities for Your Team Sports Brochure comes with four colorfully-illustrated home fire drill flash cards to help you visually demonstrate what to do if the smoke alarm sounds.